Eight new items / item groups that are discussed in this document consist of six rather modern artifacts (1400 - 1900 AD), one group of vessels and a terracotta torso from the Cypro-Archaic period (800 - 600 BC), and one special ivory item from the Late Bronze Age (1650 - 1050 BC) - all with occurrences of the FOL in them. All items from the previous research that was done in 2014 and new items that are presented in this document are collectively listed in Appendix 2. Picture 6.1: Rullstol from Finland © Meinander, K. K.
Above rullstol with the complete class 3 FOL symbol resides in the National Museum of Finland. The artifact is from Björkö island in Korsholm (fin. Mustasaari) municipality, the Gulf of Bothnia, 1850 AD. This Rullstol is one of many similar artifacts with the FOL symbols. Veera Vallinheimo notes the FOL symbol in her distaff blade book Rukinlapa: käyttöesine ja kihlalahja1 and calls it rosette net (fin. ruusukeverkko) and rosette band (fin. ruusukevyö). Rosette, a naming convention for a stylized flower design, is a little bit confusing because the most obvious flower described with the symbol is a six-petalled one, and this is somewhat far from the rose flower. A petal count of roses vary from 0 to more than 1002 and the shape of petals in the rose differ from a regular oval shape used in the FOL. In archeological terminology, a rosette is understood as a general symmetrical flower-like shape, which may have 2 to n concentric petals. The rullstol above as well as the next bridal gift items (2a, 2b, 2c) were made for decoration and functional use at the same time. The FOL symbol in forms of classes 1, 2, and 3 was a very popular handicraft decoration motif from 1700 to 1900 AD in coastal Finland. For a geometrical curiosity, straight line (the holder of a ball of woolen thread), in the middle of the object cuts the Rullstol so that the upper part of it forms a so-called Arbelos or the Shoemaker&apos;s knife3, which was discussed in Part 1 of this document. The distaff comb and blades above are made for a bridal gift. 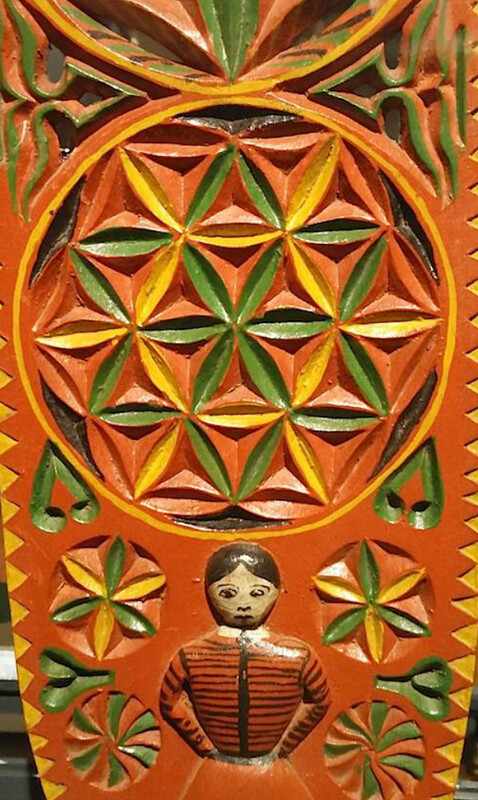 The pictures show us the Flower of Life motif in all classes from 1 to 3 as well as six petal rosettes. The motif is said to come to coastal Finland from Western Europe via Sweden and Russia. Several similar items, with the FOL creatively carved on them, are found from the period 1600 - 1900 AD. Since crafting blades (fin. rukinlapa) became a very famous art form practiced by common people, these objects with various rounded circular motives can now be found around the country from several museums and even outdoor summer markets all around the country. I would not be surprised if the FOL symbol with some of its variations would also be found as a soundhole of the Finnish Kantele instrument as it is sometimes seen on a Polish fiddle, Suka4. Also, wooden spoon holders in Poland traditionally had different FOL classes attached on them. In Latvia, the ethnic instrument called kokle5 most often has a six-petal rosette as a sound hole motif or extra decoration. Distaff blades, which are called sprēslīca in Latvian, they too seem to have applied six-petal rosette motives in quantities, as seen in the book Latvju raksti (Ornament letton) III6. The main properties attached to the Finnish distaff blades above are clearly feminine, beauty, celebration, weaving, symmetry, roundness, and circularity. Although making an impression on his fiancée in a mundane artistic way is more apparent than any other deeper spiritual meaning, at least in the modern version of wooden objects, it would be interesting to trace the source of the idea of the FOL further to Russia and Western Europe. By strict academic practice, I think it is possible to comprehensively trace and map the usage of the FOL in woodcarvings in Europe at least from 15th to 19th century. It just requires researching native ethnographic history books from different countries and their national libraries and antiquarian booksellers. 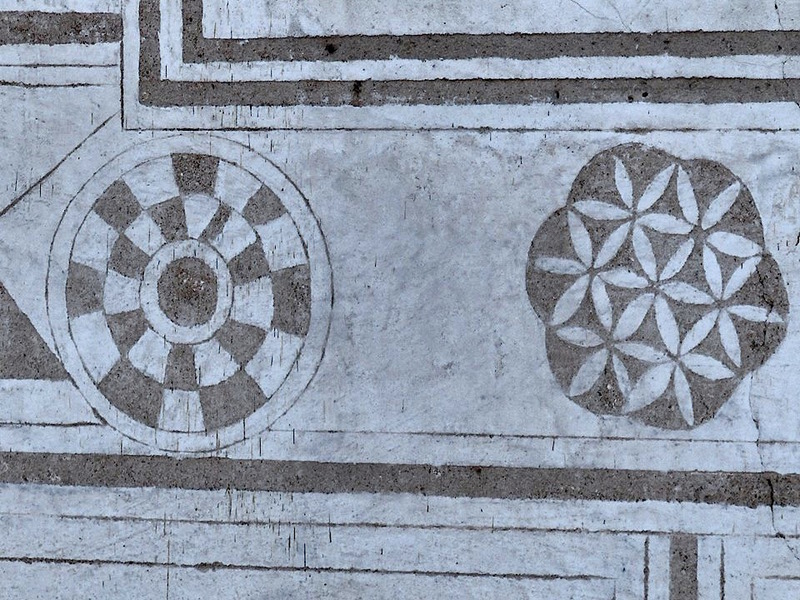 The above Flower of Life class 2 symbol (without surrounding petals) and other geometric symbols are visible in the castle of Rožmberk7 in the Czech Republic. 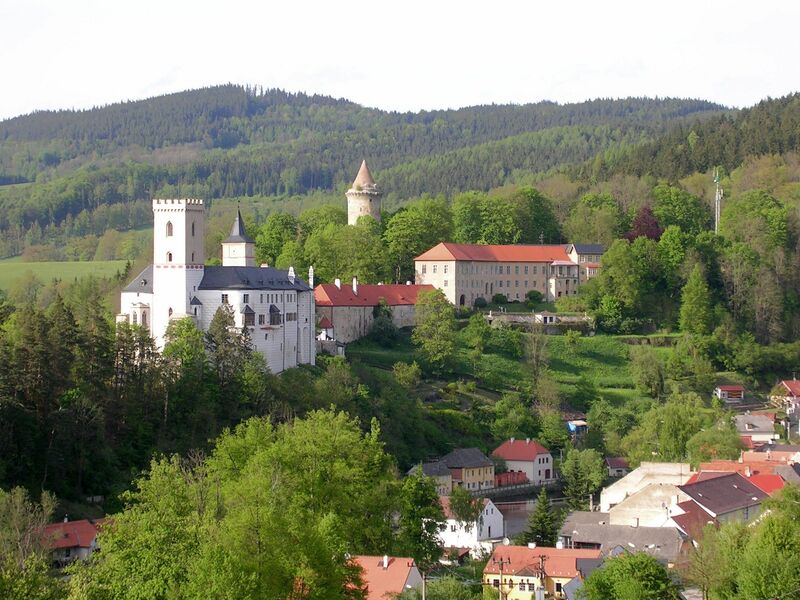 During 14 - 16th century AD, the castle was owned by a Czech alchemist. Variating geometrical symbols are probably originating from that period. 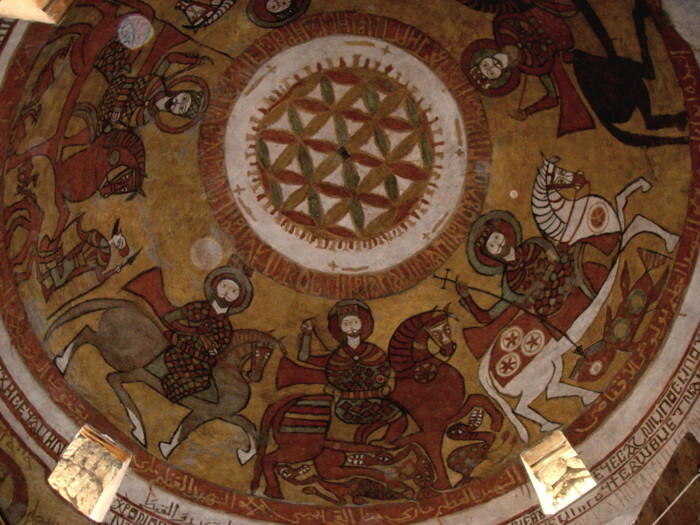 The above carousel of the saints riding on the cupola is found from the underground church of St. Paul8 in Thebes, Egypt. Among the Saints are fourth-century Roman Christian soldiers, Sergius, and Bacchus9. At the center, we can see a representation of the FOL class 2. Paintings were produced by the monastery monks in 1713, and paintings are probably overlay of earlier iconography that is lost since then. The church is one of the four churches in the Coptic monastery of St. Paul located in the eastern desert of Egypt101112. Above pottery is found from the Archaeological museum of Nicosia13, Cyprus. 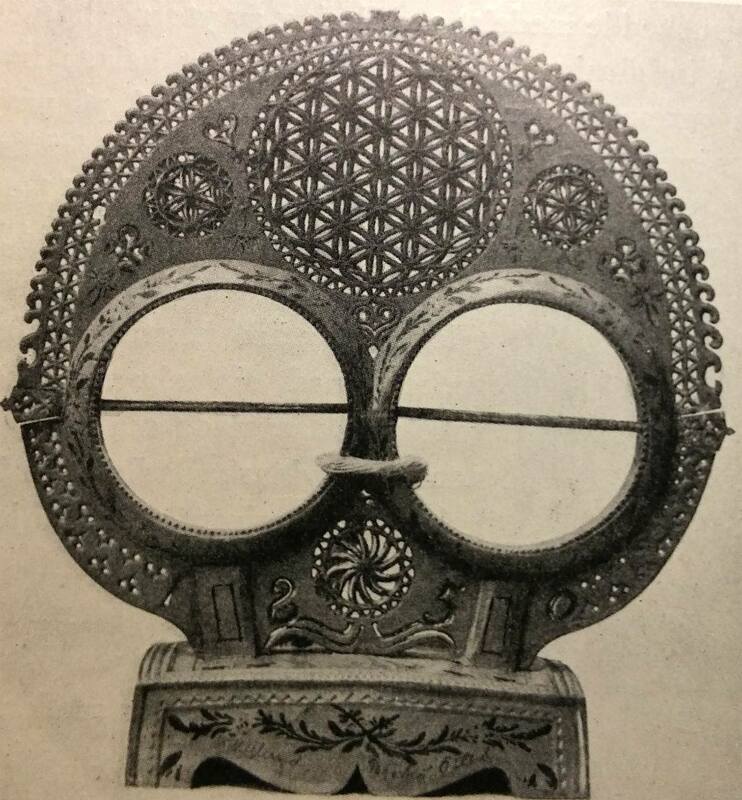 In addition to this, other vessels and the terracotta torso found in the same museum had the Flower of Life decoration belt similar to the one presented above. 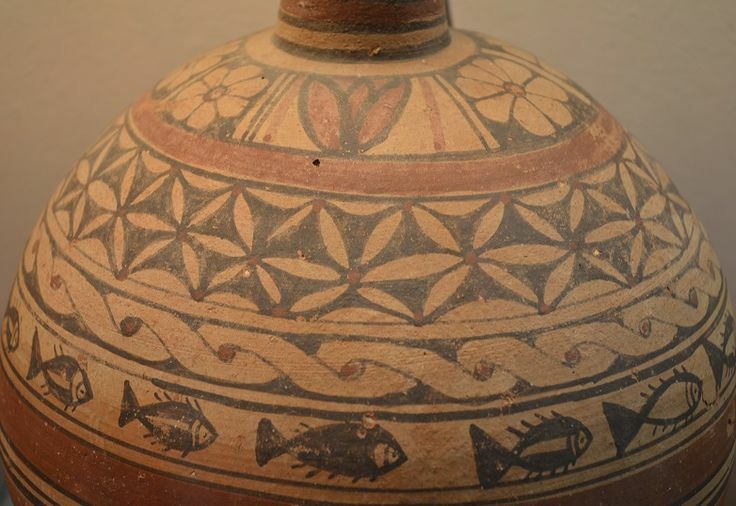 Flower and fish motives on the vessel may very well have been consciously selected by the painter. They can be classified as FOL class p because the motif is used as a band pattern rather than a symbol. This object dates back to Cypro-Archaic 1 Period, i.e. 750 - 600 BC. The pattern seems to be drawn by free hand, directly from a model, until painter has been very skilled and experienced with painting. This freehand drawing style resembles the oldest pattern (2000 years older than this vase) found as a reference in a book called The Evolution on the Mature Indus Pottery Style in the Light of the Excavations at Nausharo by Gonzague Quivron14. When painting on a curved surface, it is more difficult to be exact with the pattern than what we can see on flat surfaces. 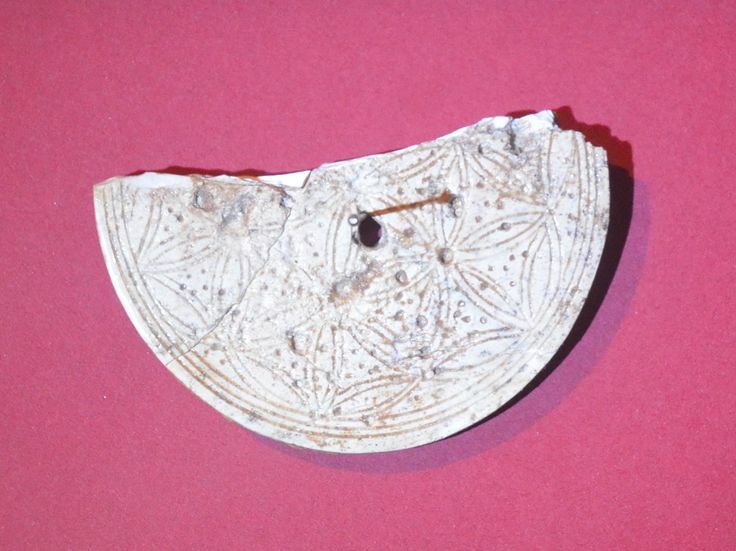 The ivory item above, probably a spindle whorl or a disc functioning as a lid, contains the Flower of Life motif class 2. It was found and categorized as a local object belonging to the sanctuary of Aphrodite, and is now visible in the museum of Palaipafos, Kouklia, Cyprus. This object is dated between 1600 - 1100 BC, making it one of the oldest FOL artifacts found in the Mediterranean world. A similar artifact was found from the British Museum already in my previous research, adding evidence of the fact that the symbol was possibly known to the Mycenaean traders in the famous trading port and island of that time. Another remarkable detail is the pointillism used on the surface of the flat ivory object. Pointillism seems to have an old and unresearched origin in the past. 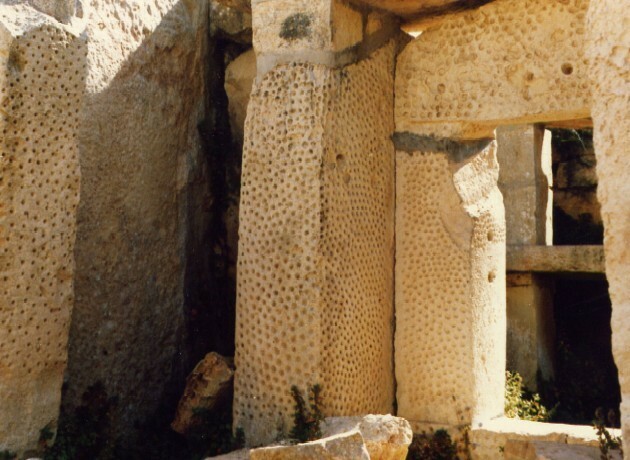 Above picture 6.10 shows an example of small drilled holes on the Neolithic temples in Malta from the 3rd millennium BC. Pitted decoration is mostly toward the Sun so that when the rays of the Sun are shining from the morning until the evening, they hit the stone facade with the pitted with small holes. The other side of the stones are blank so there must have been a certain reason why the pitted sides are towards the Sun. In many cases, the association to honey bee cells and some sea shells is easy to make from the pitted decoration. The FOL artifacts with a pitted background decoration are visible on items: 3, 5, 14, 27. Items 1 and 4 have a round dint between triangular holes surrounded by leaves. Because mosaics are made of small pebbles they may look like they have a similar effect of the dotted background, but that is hardly deliberate. It is yet to be seen if the origin of the FOL can ever reach to the Neolithic period on the fourth millennium BC. This is not likely, according to the current evidence, but a dotted motif as a background pattern of the FOL items may have a certain meaning. The type of ornaments that are seen in pictures 6.11 and 6.12 are very common in Zakopane town, Poland. The Flower of Life is called Kwiat Życia in Polish. The photograph above on the left is from the collection of Tatra Museum in Zakopane and it is used with permission15. The photograph on the right side is from the same museum, but the photo is taken and its use in this document is agreed by Andre16. You can find more similar photos like these from my Pinterest collection17. The hexagonal ornament and carvings on the wooden pole was brought from the mountains to the medieval museum of Lemesos (Limassol, Cyprus) when the original 1600 AD orthodox church roof was replaced by a new one. The underside of the pole, although too dimly lit to see clearly, also has the FOL class 2 symbol. I have found many similar samples from Romania, too. 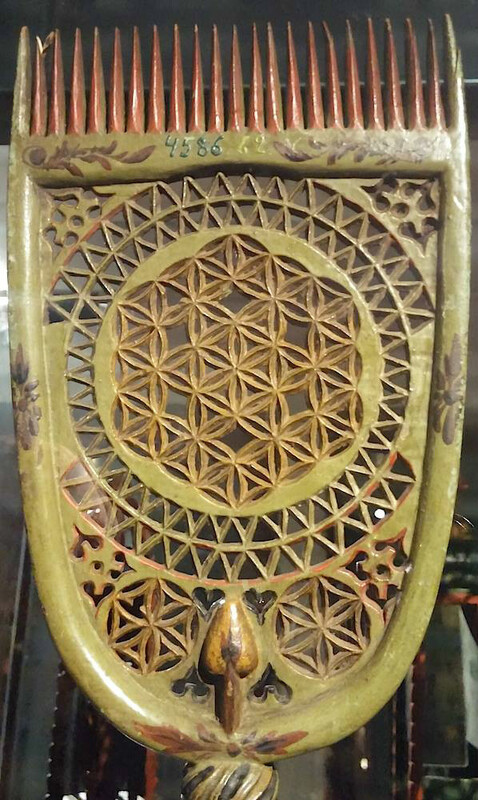 The Flower of Life pattern visible on the window background ornament facing to Mecca on the Blue Mosque in Istanbul, Turkey. The mosque was built in 1616. The organization of the work was described in meticulous detail in eight volumes that can now be found in the library of the Topkapı Palace. 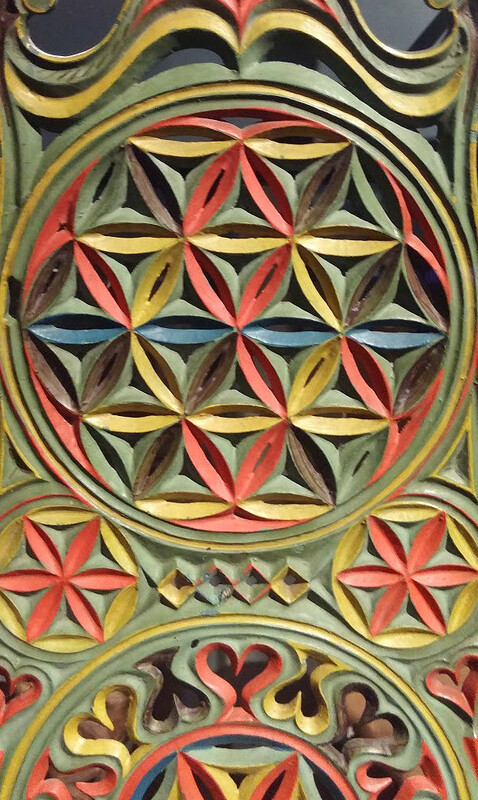 These volumes might enlighten why this particular ornament was selected to the Blue Mosque. 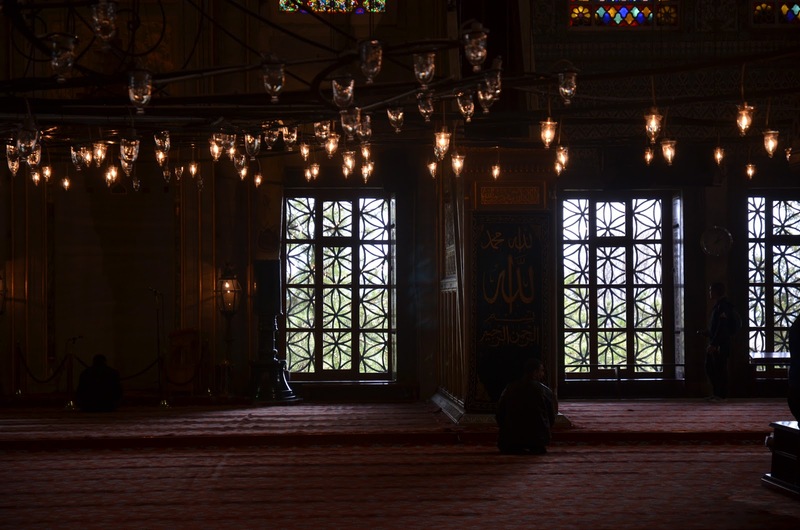 Outside the Mosque there were both six-petal rosettes and Cownose patterns on mosaic floors. Four to five million tourists visit the place per a year, but I have never found this detail of windows in the context of the Flower of Life mentioned before.